We all know the smartphone camp is split heavily between the users of Apple’s iOS, and the more open Android OS from Google. It’s a matter of opinion as to which is the way to go for many, but of you’re actually a fan of iOS and have an Android phone, or you just like to play around, then this new Android app may just be the thing for you. ‘Fake iPhone 4S’ does exactly what it says on the tin, and by making itself appear just like the iOS some of us have come to love, the app certainly makes for interesting viewing. Trick your friends into thinking you have the new iPhone 4S! 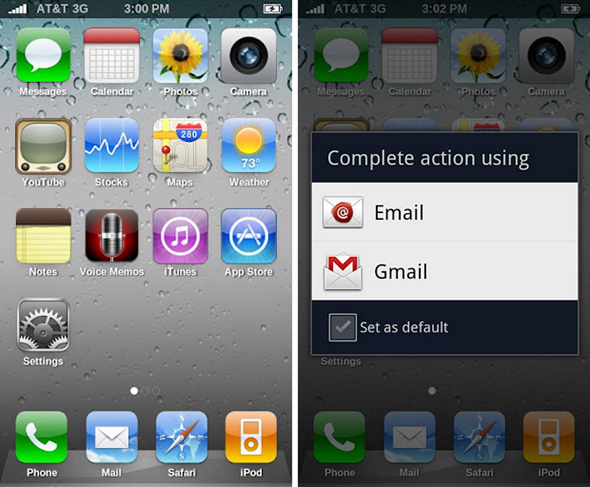 This app is a full-screen working replica of the iPhone 4 home screen. It even replaces your phone’s status bar, so there’s no hint of Android underneath. The app, once installed, will completely fill the screen with what appears to be an iPhone homescreen. Apps which have Android counterparts will run when the relevant icon is tapped, and those that do not will launch a sponsored ad, a bit intrusive but a good way to get around what does not work isn’t it? This obviously gives the game away, but also offer the developers the change of making a little money. If you really must make your Android phone look like iOS then this will do it. That said, we do wonder how useful it will be beyond the initial comedy factor. To each his own, as they say! Though there are similar apps out there which allow the user to spoof iOS on an Android device, but this one is actually quite good in terms of feel and look. We gave it a shot on our Galaxy S II and we were quite impressed with the results, and got a free giggles out of it too. Although, its not as fluid and buttery smooth as iOS but does what it should, like we mentioned before. The app’s illusion becomes even more prominent when you sport a device which looks like an iPhone 4/4S, no pun intended here. We’d recommend the Galaxy S and the LG G2X as a good contender for this app, rest is up to you, we just gave you a free advice.